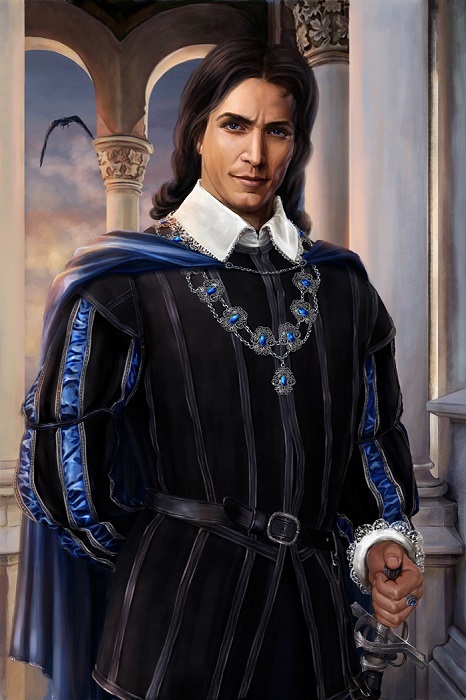 Mathalay Meravanchi is a member of the noble House of Meravanchi in Sasserine, the younger brother of Zebulon, and the uncle of Avner. Unlike other members of his family, Mathalay is the strong and silent type. He looks down on the wild, debaucherous parties thrown by his brother and the foppish behavior of his nephew and instead spends his time quietly scheming and plotting his own advancement. Seven years ago, when Lord Zebulon invested with the Vanderboren family to build Farshore; a small trading colony near the Isle of Dread, he sent his trusted, younger brother Mathalay to protect the family interests there. Mathalay looked upon this assignment as a great opportunity for himself. Recently, Mathalay has become very ambitious, positioning himself to one day become the ruler of the colony of Farshore. He desires to control all its resources and push out the Vanderboren family interests.